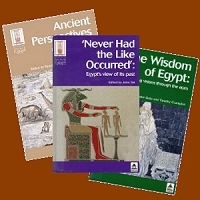 A Series of 8 books looking at different aspects of Ancient Egypt. - The Wisdom of Egypt: changing visions through the ages. - Views of Egypt since Napoleon Bonaparte : imperialism, colonialism & modern appropriations. The complete set only £165 (saving £35) , or individually priced at £25 per volume. The flowering lotus was the symbol of Upper Egypt. The flower is firmly linked with the rising and the setting of the sun, and thus to the sun god and the story of creation. The lotus motif is a frequent feature of temple column architecture.